Texas Rep. Beto O’Rourke raised nearly $40 million in the third quarter of 2018, smashing the all-time record for most raised in one quarter. Texas Sen. Ted Cruz has been consistently leading in the polls, outside the margin of error, and receiving over 50 percent of the vote. O’Rourke revealed that he wouldn’t be sharing any of the cash he amassed with the other Democrats in tight races. Democratic Rep. Beto O’Rourke continues to lag Republican Sen. Ted Cruz by increasingly wider margins in the Texas U.S. Senate race, but his ever-increasing war chest could be signaling an intention to launch a 2020 presidential run. O’Rourke gained national attention after a constituent asked the Senate hopeful in August if he felt that NFL players kneeling for the national anthem was disrespectful to the country and America’s veterans. In a now viral interaction, O’Rourke disagreed and commended the demonstration. The response lavished praise from the Hollywood elite, springboarding the congressman onto the daytime and late night television circuit. As the Senate race tightened to a margin of single digits in the consistently red state, speculation of O’Rourke entering the national political arena began to percolate. Later, O’Rourke was even included in CNN’s 2020 presidential poll, where he ranked as a top 10 contender. Tied with former New York City Mayor Michael Bloomberg, O’Rourke received 4 percent of the total vote. Accordingly, O’Rourke has received more campaign contributions in one quarter than any Senate candidate in American history. In the 3rd quarter of 2018, the El Paso congressman raised a staggering $38.1 million, bringing his total amount raised to $62.0 million. Comparatively, Cruz raised $12.4 million, bringing his total to $24.5 million and placing him as the third highest fundraiser of the 2018 candidates for Senate, according to The Dallas Morning News. Both candidates have been burning through their cash at relatively high rates, yet still have significant reserves. At the end of the third quarter, Cruz had $11.3 million in the bank, while O’Rourke maintained a $22.9 million balance. O’Rourke revealed Monday that he wouldn’t be sharing any of the cash he amassed with the other Democrats in tight races, telling reporters that he must “honor the commitment” to the people who donated specifically to his race. The exchange sparked even more speculation of greater ambitions since it’s commonly contended that there is no use to having leftover campaign money if one loses the election. However, O’Rourke’s campaign maintains that it will not have trouble spending the excessive cash reserves. In addition to millions spent on TV ads and Google advertisements, O’Rourke also has to finance the Democratic infrastructure. Because Democrats have not been competitive in statewide races in Texas for decades, his campaign had to virtually build an entire field program from the ground up, The Wall Street Journal reported Wednesday. At a cost of approximately $3 million per month, O’Rourke has been able to employ several hundred people to work out of 10 permanent and 70 temporary offices. As of the second and final debate on Tuesday, Cruz had a healthy high single-digit lead in the polls and consistently received over 50 percent of the vote. O’Rourke had been promulgating progressive policies, largely unpopular in the state of Texas, and the debates served as a venue to showcase just how far left he stood, especially in contrast to Cruz, a conservative bellwether. 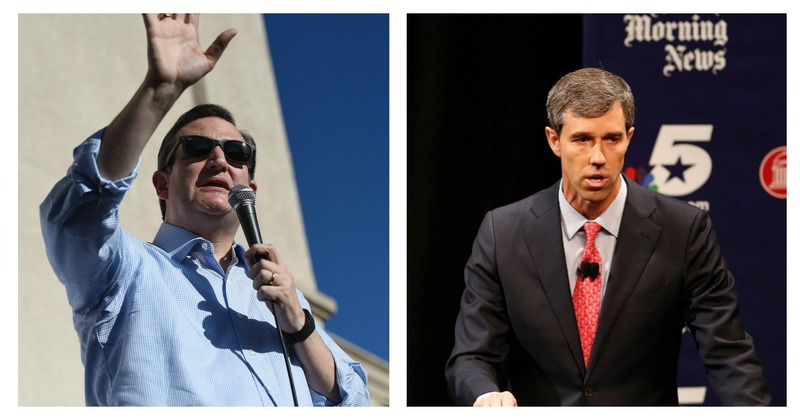 “Takeaway from #TexasDebate: Beto O’Rourke realized he’s not going to win a U.S. Senate seat so he shifted straight to running for the 2020 Democratic presidential nomination,” David Martosko, the U.S. political editor at the Daily Mail, tweeted Tuesday. O’Rourke did not respond to The Daily Caller News Foundation for comment. This post has been updated to state that O’Rourke has received more campaign contributions in one quarter than any Senate candidate in American history.